“It was a normal day on Monday 21 January in the majority of our schools in the province, teacher attendance was good but we did not have the majority of our students. I went around the schools and I found out that students’ attendance was very low. 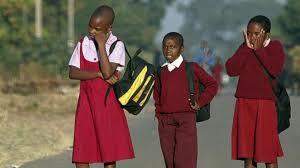 We are appealing to parents, guardians to send their children to school. Teachers are eager to execute their duties in schools,” said Mrs Kaira. “We will make sure that we cover the syllabus as expected of us that’s why we are appealing to all parents and guardians in Bulawayo Metropolitan Province to send children to school. We are ready, we want to return to the classroom,” she said. “The sporting calendar has started. Our schedule is tight; there is a lot of activity that we need to do in our schools, so we need children back in schools. We have to be in the classroom; we have to start athletics. The first term is athletics season so we don’t need to inconvenience ourselves and inconvenience the students as well,” she said. Mrs Kaira said there were no reported incidents of missing pupils as a result of the violent protests. She said all children from Bulawayo were accounted for and are safely in the custody of their parents and guardians. Turning to the issue of a job action by teachers, Mrs Kaira said she was not aware of any strike as was circulating on social media. Matabeleland North acting provincial education director Mr Jabulani Mpofu said: “Pupils turned up for lessons but not all of them. We urge parents to release their children, so I engaged our Provincial Affairs Minister, Cde [Richard] Moyo to assist us in engaging parents because most parents were still hesitant and I’m sure he has issued a Press statement to that effect,” said Mr Mpofu. “All schools are open but the turnout by the learners was very low. The teaching staff and headmasters were there but the learners were very few. We hope those who attended school today will tell their classmates that lessons went on normally today,” said Mr Masukume. Zimbabwe Teachers’ Association Chief Executive Officer Mr Sifiso Ndlovu, said most teachers were incapacitated but they were not on strike. “I want it to be known that teachers are failing to get to work as they are currently incapacitated. They are not on strike but just do not have the necessary means and resources to get to their work stations and deliver lessons effectively. Transport fares have gone up so most cannot go to work, especially those working in rural areas where they have to pay doubled fares,” he said.